New Imaging Technologies (NIT) offers CMOS and InGaAs imaging sensors and cameras operating over an extraordinary dynamic range of more than 140dB. Our sensors are particularly useful for machine vision, automobile and autonomous driving, biometrics, security and surveillance. NIT delivers from large volume production down to small numbers and custom products. Our facility is fully ISO9001 accredited. 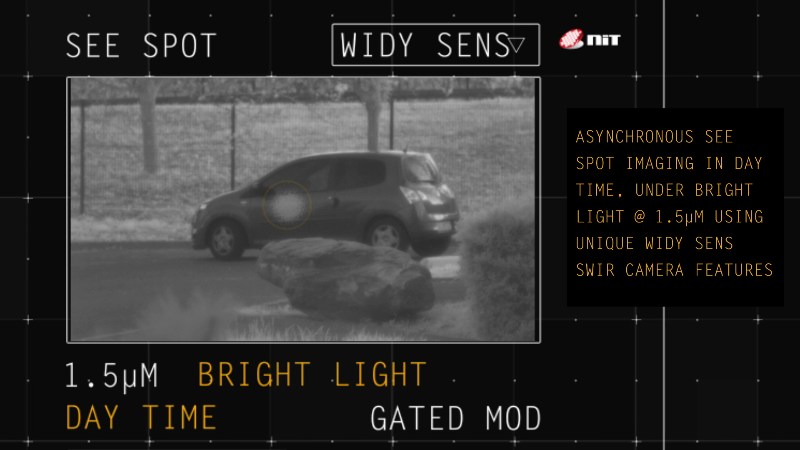 NIT launches a new SWIR Gating imaging demo video. The video illustrates the WiDy SenS Gating capabilities and how to cover several applications with a single camera. Get to know more our WiDy SenS in gating imaging application. We glad to announce that our newest test of WiDy SenS camera is now available. This test compares the WiDy SenS performance, featuring SWIR Gated mode, with a visible camera. It illustrates the WiDy SenS Gating capabilities and how to over several applications with a single camera. 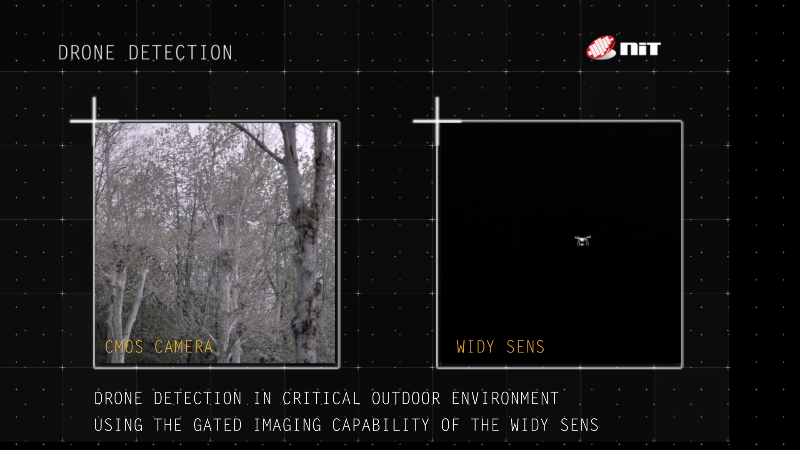 Drone detection in critical outdoor environment using the gated imaging capability of the WiDy SenS. 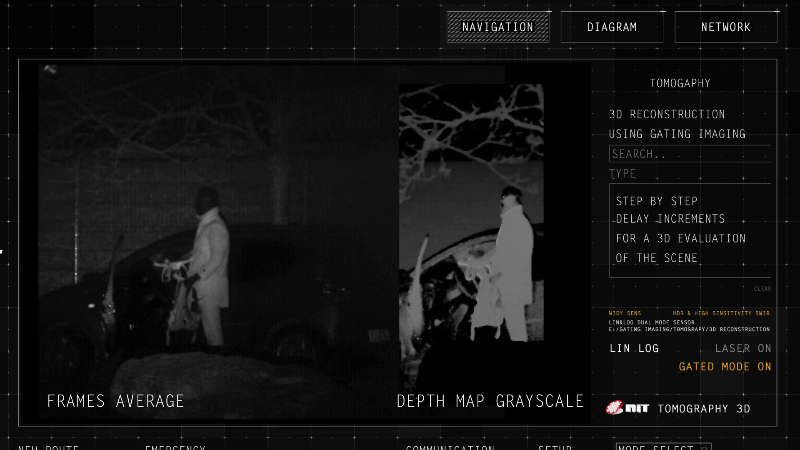 Complete background and foreground suppression for a clear identification of the drone threat. Want to get notification of our news? NIT will present at booth#224 at SPIE Defense & Commercial Sensing, Baltimore, USA from April 16th to 18th, 2019. Find out what NIT bring to SPIE. Until then, discover how SWIR cameras works in laser process, in this case, additive manufacturing. Join us at SPIE Baltimore. Attending SPIE Defense & Commercial sensing 2019? We’re excited to meet you at booth #224 and share our expert guidance, technologies, and SWIR products for advancing your vision ability in your application. This year, at SPIE 2019, we will introduce our high-end camera WiDy SenS with new advanced updates. This new version of WiDy SenS make it a cost-effective solution for your imaging challenge. Our WiDy SenS series, High Sensitivity & High Dynamic Range SWIR cameras, with the Gated mode option, are capable of providing high quality images in all lighting conditions. Don't miss the chance to test our SWIR cameras' performances on site and discuss with our experts to get the cutting-edge SWIR products. Schedule our meeting in advance to have quality discussion. See you there from April 16th -18th, 2019! Get to know more our SWIR cameras in action. With many advantages of NIT SWIR cameras, such as HDR patented technology, anti-blooming native functions, high frame rate, working with lasers become simpler. Following the first part of our case study - Additive manufacturing, this time, discover how our SWIR cameras give the ability to bring an extra eye on the melt pool or any similar conditions. SWIR for inspection - Reveal the heart of you material. For the past years, the SWIR band has been recognized as one of the best wavelength regions for industrial inspection. Whether detecting cracks or defects on a wafer or solar cells panels, InGaAs imaging devices are suited for seeing through silicon. With HDR patented technology, high sensitivity and a plug-and-play integration, NIT SWIR cameras, especially WiDy SenS, can help inspection process easier, more accurate and cost-effective. Our demonstration, featuring NIT WiDy SenS and Effilux SWIR backlight, illustrates the advantages of NIT SWIR cameras versus visible cameras in detecting defects, trapped air and component observation for silicon wafer. Thanks Effilux for this collaboration. If you cannot access YouTube, please contact us to watch our video on another platform. Among the WiDy family, the WiDy SenS offers the highest sensitivity in SWIR band, makes it suitable for Semiconductor inspection. Thanks to a small pixel pitch of 15µm, the WiDy SenS camera can easily be used in a microscope inspection machine for small defect detections. The WiDy SenS cameras come with a 46x46x57mm3 form factor and represents a cost-effective solution for an integration into a semiconductor production line. NIT SWIR cameras for various applications. NIT experts team is always available for all your needs. Please feel free to contact us to get your answers as soon as possible.